Hi all I am searching for any bows built by Ron Fox prior to Ron King taking over the business. In particular I'm searching for a "Raider". Its a 3 piece recurve similar in lines as the High Sierra but made from action wood that was popular at the time. Here is a pic that I lifted from an old catalogue I have. Some one must have seen one of these bows or may even know where one is , any info is helpful and appreciated. Ron Fox lived right here in Sandy before moving to northeast Oregon and eventually selling the business to Ron King. 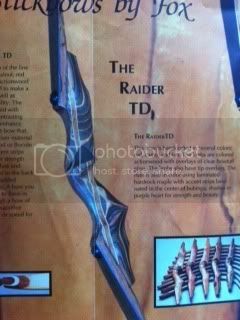 I've never seen a Raider for sale anywhere ... have you contacted Fox Archery to see if anybody they know might have a Raider sitting around collecting dust? Yeah mate , I have bugged Ron King at length, he has helped locate and secured 2 rare bows for me already but he didn't ever know of a raider . Try Ted Fry at Raptor Archery in Hood River, Oregon...Google him. Huge resource of information!